Last night more than two hundred people occupied unused land in Germiston, on the East Rand in Gauteng. Last night more than two hundred people occupied unused land in Germiston, on the East Rand in Gauteng. We laid out our design for the occupation in the afternoon, built throughout the night and slept on the occupied land. Around 350 stands have been marked out via a democratic and carefully planned process. The new occupation has been named the Zikode Extension in honour of S’bu Zikode. 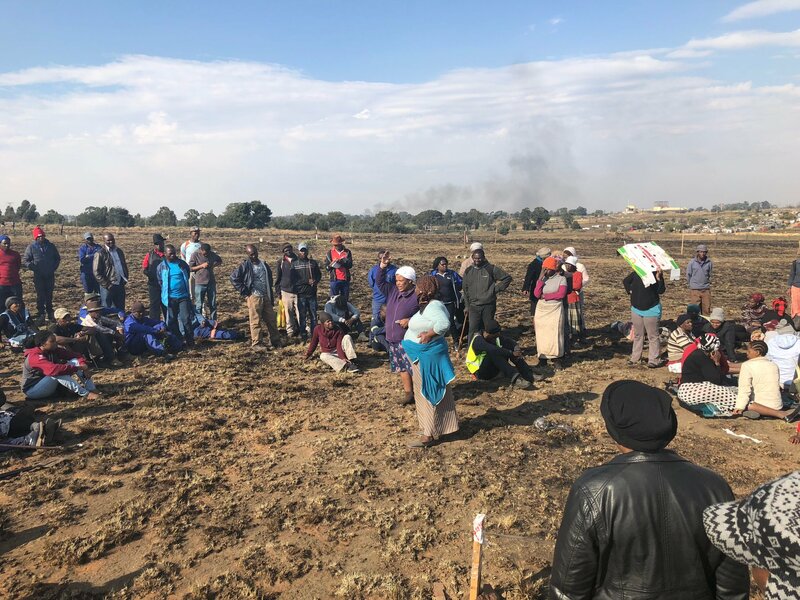 On the 8th of November last year residents of the Good Hope Settlement in Germiston attended the Land Summit called by Gauteng MEC of Human Settlements Paul Mashatile. He told us that we must identity available land and that his Department would then sit and talk with us with a view to acquiring that land. We had already identified the available land that will be good for us as part of our programme of grassroots urban planning. After the Land Summit the MEC’s office mandated a delegation to work with us. On 22 November we met with people from the Provincial Department of Human Settlements. Officials visited the land that we have identified. The geo-tech has been done and it has been confirmed that the land is good for housing. But then the officials all went silent. We contacted Paul Mashatile directly but he did not respond to us. In February Abahlali baseGood Hope in Germiston issued a statement making it clear that we would occupy unused land if we continued to be ignored. Despite numerous attempts to engage the politicians they have continued to ignore us. This is why we have now occupied. The police arrived this morning with big guns and destroyed all the structures that had been erected during the night. They stole our zincs and burnt our poles. They also threw some children’s school bags into the fires. Some of the police officers were very rude to us, swearing at us and insulting us. One white police office called one of our comrades a ‘baboon’. A journalist was pushed around and threatened. We marched behind the police truck until they left. After the police left a few young men in EFF regalia arrived. They told us that we must go because they want this land. We are not going anywhere. We occupied because we are sick and tired. We are sick and tired of being ignored. We are sick and tired of living in dirty, overcrowded conditions, with rats and in shacks that flood every summer. Some of us have lived in these terrible conditions in the Good Hope settlement for more than twenty years. We cannot rent our whole lives. We cannot live in such unhealthy and dangerous conditions, and without electricity and toilets, for our whole lives. We want our children to be healthy and safe. We want to live with dignity. We want land and housing. Some of us have lived in the city our whole lives, and are no longer young, and yet we have never owned a piece of land. We don’t want to die without leaving something for our children. We are sick and tired of getting food parcels and lies from the politicians at election time. We want land and dignity. After our shacks were destroyed by the police we decided to continue to resist by rebuilding. All the occupiers have given R10 each so that that we can buy more materials and build one structure that we will all sleep in tonight. If the police continue to demolish we will continue to rebuild. The politicians and the police take us as a joke. We take our lives seriously. Some people are afraid of the Councillor and the ANC. But we have decided to use people power now. This is our long journey.